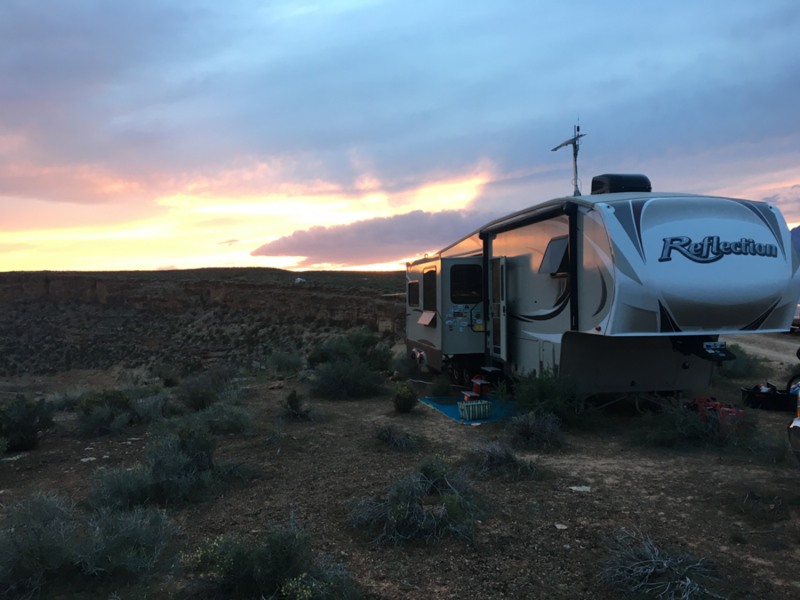 After the fiasco of getting to Stewarts Point on Lake Mead, we were invited by our rescuers to come to their boondocking spot just outside of Zion. There were a few other people coming to join them and we were so excited to meet everyone. We packed up and headed to a cliff in Hurricane, UT. I have to admit. I had no idea how afraid of heights I really was until I had kids. Now, I'm super paranoid. Maybe you recall the brief panic attack I had when we reached the summit of Bear Den in New York. Yeah, I'm still afraid of heights. I can't be the only one who immediately pictures their kids falling to their death when they're on the edge of a mountain. Jonathan thinks I'm a pessimistic but I say I'm just a realist. I pray and pray for God's hand of protection over my kids every day but I still worry. I'm a mom, I don't know how to make the worrying stop. And wouldn't you know, Adali had to just sit right on the edge. She loved this spot. She spent lots of time here watching red-tailed hawks soar above. What a perfect spot for her. Once we pulled in to Hurricane (pronounced HUR-Can) and found BoldAdventure, Jonathan jumped in the truck with JorDanee and scouted the area that would best work for our beast of a rig. Everyone else there had airstreams and small trailers then we show up trying to get this 37' 5th wheel into a tiny spot along the edge of a cliff. It was tricky but we got it in there. Some plants may have been injured in the attempt, but just look at this view. We were so excited to be with BoldAdventure, Up In The Airstream, the McCartie's and Meant for Adventure for a few days. The kids immediately started playing with their new friends and it was so great to get to know everyone a bit better. Lots of people worry about whether or not their kids will be social on the road, but we have found that our kids have made new friends much easier since we have been traveling. Legos are the universal kid language. We didn't do a whole lot while we were there in Hurricane. We talked, rode some trails, played and watch amazing sunsets with new friends. It's a magical thing when you meet families that feel like long time friends. We can't wait to meet up with everyone again on down the road. We had to leave before most everyone else to make it to Oregon on time. Originally we planned to take another week to drive all the way to La Grande, but we couldn't find any open state parks or boondocking sites along our route so we ended up driving 14 hours in 2 days with an overnight stop in Salt Lake City. We don't ever want to drive that much in two days again. The kids were champs and we made it to our destination safe and sound!